Today I was checking some suits, when I found a comment on someone's Guest Book advertising a new fashion line: DarkLicious. Nicole (coconut_nicole) looks amazing! And if check out the blog, you will see that she will always be the face of stardoll fashion week. BUT, to give other girls/guys a chance, she will need a buddy! So if you want to be the face of SFW aswell click here! As you all know, our dear writer Abbie has some projects going on besides writing for this blog. One of them is the very interesting magazine Monster Magazine! It looks like mystery and anonymous users are the it thing on stardoll. 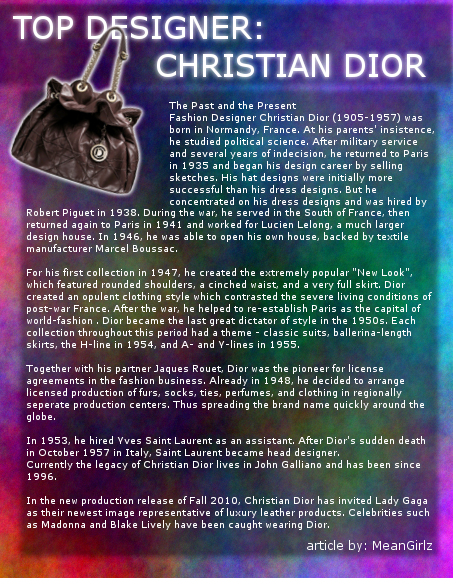 And has you can see, it has reached stardoll magazines aswell! We have already seen it before, in spoilers, but on the cover, to me, it's something new! And I must say: I like it! And there is a very big contrast from one page to another because first she is all covered up and then she is naked! Have you guessed who the covergilr is? 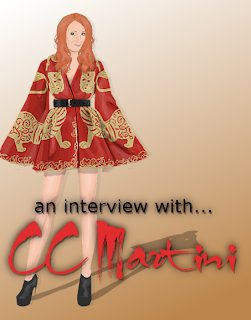 An interview with a REAL celebrity! How amazing is that? This magazine has made stardoll magazine history. It was and interesting interview. The questions were simple and straight to the point. And CC seemed very nice and approachable. There was also a fake interview to Lady Gaga. It was very well done. I've seen some online interviews of her and, correct me if I'm wrong, the girl who wrote that interview has seen lots of videos of Lady Gaga online. The answers looked like it was Gaga talking! Some of them it looks like I remember her saying it somewhere. So, I must say it was really well done and a great idea. I liked to see some fashion history. 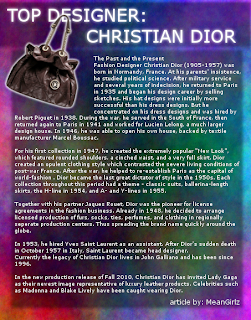 Like the Christian Dior article (the image above). I liked the fact that there where articles like that, not just about fashion, but other stuff aswell! And, I don't know if it was on purpose, but it was a good idea to put the Lady Gaga interview and the piano article. One thing I would like to have seen more is more fashion tips and stuff like that. Altough we see that often in stardoll magazines, I always like to see more, because fashion is alwys changing it's something that is never the same. And I bet this magazine can give us some crazy makeup/outfit tips about a different style. First of all,sorry for lack of posts and inactivness. As of today,it has been open for six days and we have over 700 hits! Only two out of ten models have been picked. I have worked so hard on this so far,and if no-one applies for other jobs then . . . So if you are a GRAPHIC DESIGNER,please click here and apply. Second new project I want to tell you about is Venus clothing line. It is owned by our very own Abbie! She co-owns this line with Plami161. This is the spoiler for the line,and it is amazing. They are currently having a competition that could get your deisgn in SFW. 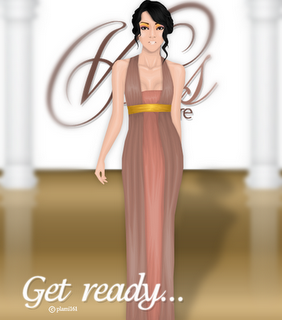 I entered,the theme is Grecian which just means Greek. It took me awhile to thunk of sometihng,but trust me. You'll be glad you entered if you did and when you do! I'm actually not going to list all of the new projects in dollywood in this post,but don't worry. Hi dear readers! I'm very sorry for not being very active, but since school has started everything has been crazy. Plus I'll start having lots of extra curricular activities which will not make things easier. But I will try my best, I promise! As you can see by the title, I'm showing you another non-SS look! You can get all of it for 23SD. A bit more expensive than the usual outfits I make, but still not very expensive. And you can always take some stuff out, like the bag, the necklace onr the belt. I just put it because I think it gives and extra touch to the outfit, or else it's just to plain! I hope you like it, and I will try to make 1 or 2 of these outfits per week. Between magazines and clothing lines AND awards shows,Stardollians of the world have a lot to do. 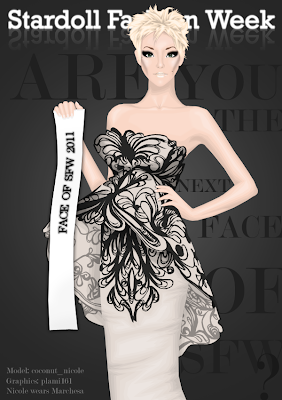 What with people getting ready for Stardoll Fashion Week too! The fashion craze has just begun! Anyway,I decided to avert my attention to a magazine . . .spoiler,that is. I'm sure thats exactly what they had wanted! I will say,from the bottom of the hand down,it seemed like the arm looks . . .bendy? Like really bendy,like a bendy ruler or rubber pencil! But still,I look forward to the release of this magazine! What do you think of this style? Do you like it? I first arrived at the party with high hopes but it came to my attention that there were few attendees. Nevertheless I stayed at the party, anticipating the collection. Waiting and wondering, how will the models look, will the clothes be good? All these questions going through my head. The owner, sinbabee, messaged me over chat saying 'Lily's not going to make it'. She seemed really worried and so did I. I thought I'd have to wait for her arrival. Shortly after I got another message over chat and it was saying that it had been released. I quickly rushed to their site and drooled. The collection was more than amazing, more than fantastic, more than excellent. It was AWESOME! The outfits fit the models really well and the clothes were so realistic that I wanted them. NOW! Here are my favourites; although it was hard to choose. Model 1: I loved this models walk and the dress was fitted. Maybe not the best option but the outfit overall is really good. I also enjoyed the colouring and how it matched the make-up which was really good. Model 2: This is me favourite from the whole collection. It is totally unique yet it has some similar aspects such as the studded neckline and cuffs. This is really realistic, I love the glitter, models hair and the appearance as a whole. Stardoll Fashion Crazes BEST BUY! Model 3: I particularly liked the outfit and shoes. It was a simple design with customations. Although the outfit looks great, the hair and make-up didn't appear 'matching' to me. So I thought that I'd finished watching the fashion show when I was greeted with an accessory line. They all had a similar design but with different colours so it was difficult to choose favourites as they all rocked. But the purses were the BEST part of the collection. They added the finished touch. So thankyou to all people who took part in this collection. We declare this a SUCCESS! 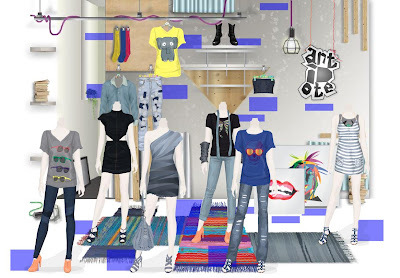 If you have been on Stardoll since the beginning up until a year ago then you will know how cheap clothes used to be. An example of Stardoll's 'kindness' was the Kohls store which had all of its clothing at an average of 3/4sd but today you'd be lucky to find a 6sd dress! Especially for a non-ss. These days I resort to Stardesigns from other members. The designs are reasonably priced and really good designs and the best part, they're almost unique! My favourite designer for my style of clothing is from Melody1970. Unsurprisingly when I visited her page a lot of her designs were sold out, and ironically they're my favourites that were sold! Anyway the best dresses she makes (in my opinion) are 8sd and I have 2 of these! Totally affordable and convenient. 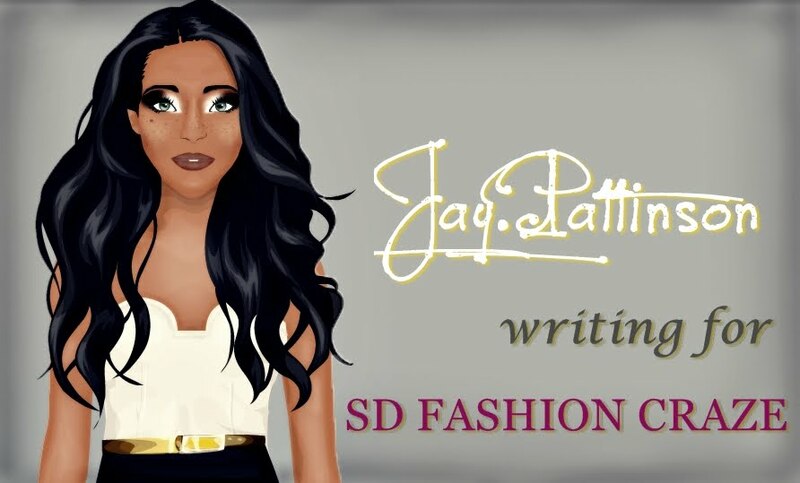 Stardoll Fashion Craze's BEST BOUTIQUE. I know this blog has been a bit inactive,and I apologize for that,I know that Taylor and Jessica's schools have started so they can't be as active. My school started too but , I dont get as much homework as they do so I can still come online. Yesterday or the day before,Antidote came out. I personally love this store. For its bright colors and originality. In the last few collections , Antidote has lost the originality point,but the clothes are still gorgeous to me! I bought . . .three dresses and two pairs of shoes. I don't have a picture for you,because when my laptop drank tea...My right mouse thingy doesn't work so its too difficult to make a picture. In any clothes,its important to have originality in it,right? That is something(like I said) that Antidote has. I remember the first piece of it that I bought. It was a blue top,with a pink skull on it. But Im positive I sold it. And then there was a collection filled wit ice cream and pinkness! I bought a dress out of that collections. I remember , the collection before this one,I was determined to buy SOMETHING. I ended up buying a dark green bag,its actually really nice! So,I'm going to do a proper review on the items I bought. First one is the . . .One Shoulder Dress. This is a dark purple very mini dress,with a grey belt around the waist. I absolutely LOVED this dress,and bought it even though it was 100SD. You could barely see the pink line on it! Its also purple,which can be a hard color to work with,but as long as black,white and grey own a spot in your closet,your fine. This is okay to wear with jeans,I think. I tried it with black tights and I didn't like it,but thats just my opinion,Im sure there are tons of ways you can wear this dress. Second item is the . . . Grey And Purple Heeled Graphic Boots. And since their grey,they are very versatile. They go perfectly with our purple dress up there too. These boots,can match NEARLY everything because their grey. My favourite colors are,white,black and grey. These style of boots is also quite popular I think. I bought the same boots in the purple too,so I decided to just devote one paragraph to the two of them. The purple boots are not as versatile as the grey,so I will be wearing them less than the grey ones,but still I love both of them equally! I was hoping the purple boots would match the one shoulder purple dress,but their two two completely different shades. But,people say you should take risks with fashion,so one day,I'm sure I will pair them together. The second last thing I bought was the . . .Side Ruffle Sheath . This is a blue dress , by the way. But this is by FAR the best thing in the whole collection! I paired it with the grey graphic boots,and left it for two days! The last thing I bought,was last minute.. The red shoulder pom pom dress. I was looking to get it in the fully black one,but sadly it was sold out. Some people will say its ugly,but its one of the items that has originality in it! I will say,it goes with very few things,but I am determined to make it work. Its not versatile either,which makes it harder to pair things with. Don't you love the new Non-ss hair?! I can not express how much I truly love these, they are just gorgeous! What do you think of them? The newest antidote collection has let me down big time, I only like two items. The rest, I feel, are boring and not what is expected from Antidote. Well,today I found out that I am NOT a Libra but a Virgo. Some people might be saying "You can't change your Zodiac sign" but if people messed up the astronomy then yes,you can,and you have to really. There is a new Zodiac sign called Ophiucus/Serpentarius it means 'Serpent Bearer' for those who don't know,a Serpent is a snake . But it only affects you if you were born in '09 or after so if your reading,this,I doubt your two/one years old. I'm actually quite upset about this :P .
My dad got me a 'Scales' charm for my birthday (I think it was my birthday..) an it was Thomas sabo , so it cost about €40 - €50 ! So, go on Google and find out what your starsign is NOW. I really like this months hot buys and I can't wait until the leather pants come out, they are my favourite. What is your opinion? Which ones do you like? Has you can see by the title, stardoll is almost reaching 90 million members! How crazy is that?! It's almost impossible to belive there are more than 80 million girls playing on this website. And thinking there are so many pepole from so many different parts of the world... I just think it's amazing! Sorry for my absence over the past . . . week :S .
But I DO have an explanation. My sister was drinking tea with OUR laptop on her lap and the mug handle broke so..
After I dried off the laptop,and after my computer-expert of a brother (:P) looked at it,all it needed was a new keyboard! I will say,we have a computer in my house so I will admit I could have posted,but I hate using the computer,laptops are easier for me. So,after a virus scan to rid the laptop of anything else,I CAN USE IT! The 'Reminder' part was to REMIND you all of our competition! I know this blog has been a TAD inactive over the last week or so,but don't worry. We'll get 'get back on track' . I'm a big fan of her DYI outfits, they are all amazingly well done, and this one was no exeption! Does this look like a real starplaza dress or not?! And the thing I admire the most about all of this is that it's so simple but so stunning! Usually pepole think it's all about lots of accessories and tons of clothing on (which is something not easy to do, at all! ), but this girl proves that simple is has elaborate. And I wanted to post and outfit she made with lots of laces, it was amazing! Another girl that unfortunately isn't active on stardoll anymore (only comes to speak with her friends) is gweneee. She made one of the best DYI dresses I've ever seen! I absolutley love it! It's amazing! I was amazed by this outfit. And she looks so simple. The hair, the dress, the makeup,... Everything! 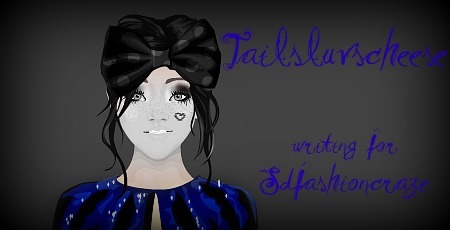 I'm really sad someone with this imagination and fashion sense has left stardoll, I truly am. I've been at the award show and I must say: it was really fun! Their idea to have the party via skype was an awsome idea. I usually didn't attend any parties because it was almost always via guestbook, which I taught it was horrible! I couldn't understand a thing! The only problem with the award show is that pepole talked too much when they should be quiet! Dei had a little bit of trouble controling pepole, But she did an amazing job, and kicked pepole out a few times (and I laughed everytime that happend, haha).